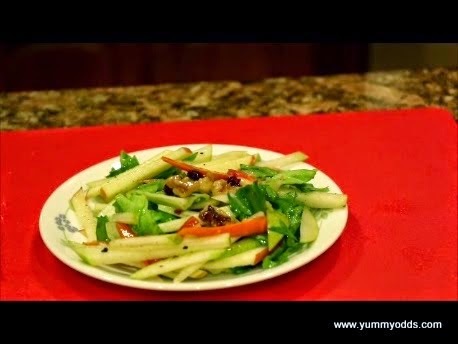 This is a quick and simple Salad recipe that is put together with Fruits and Nuts. The best part in this recipe is Light-Lean home made salad dressing which makes this Salad Healthy. Here is the recipe, Njoy! Take a Small container or bowl and add Olive Oil to it. Add Lime Juice and mix it well. Add salt, black pepper and chat masala to it and mix it very well so that all the spices are dissolved in oil. Set it aside for 5 min. Add Salad Leaves to the medium Bowl, add Carrots. Add Apple, Pear slices and mix it gently. Add Walnuts, dried Cranberries and give it a gentle stir. Now Pour home made salad dressing and give it a gentle coat so that salad is coated thoroughly with dressing. That's it Healthy Fruit n Nut Salad is ready, Store in the refrigerator until you serve. or Serve Immediately to enjoy the crunchiness in this salad! Thanks a lot for posting this video recipe. Wonderfully made.